(Liaoning News Channel) February 8, 2005. In April 2004, Ms. Guo of Shenyang became pregnant. After a few months, she began to gain weight rapidly. In six months' time, she had reached 70 kilograms in body weight. She went for a medical check-up and found out that she was carrying triplets. 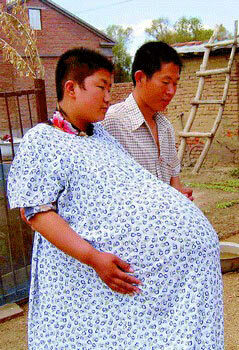 On February 1, 2005, 95-kilogram Ms. Guo delivered one boy and two girls just in time for the Chinese News Year. (Beijing News) June 12, 2006. 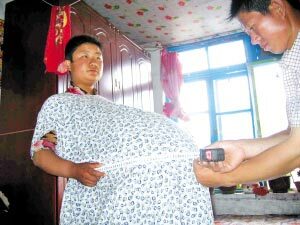 The "Super Pregnant Woman" from Songyuan city, Jilin province has waist length 1.75 meters, or 8 millimeters longer than her height. 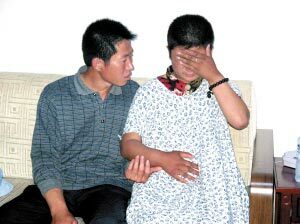 In Ningjiang of Songyuan city, a pregnant woman had a waist as thick as a fully pregnant woman. She went to a hospital for a check-up and was told that she was carrying triplets. In another check-up two months later, she was told that she was carrying quintuplets. After netizens read the report and saw the photos, some of them were dubious and others were downright certain that this was faked. Netizens point out: from the photographs, the pregnant woman did not look stressed with such a large belly. She seemed to be able to move around upright without any sign of being forced to tilt forwards or sagged downwards. Instead, she stood there to have her waist measured with ease. According to newspaper accounts and medical histories of quintuplets, the woman should be exhibiting signs such as swelling in the limbs, difficult in breathing, lack of mobility, deterioration in the functioning of the heart, lungs and kidneys, etc. She should not be able to stand, sit or even lie down flat; she should be stuck leaning sideways in bed. One netizen outright questioned whether the woman had stuffed something underneath her clothes. Nevertheless, the media were on a roll. On June 13, the reports were about "how she stretched and tore a dozen dresses already." On June 14, the reports were about "a family conference to decide whether she should go to Changchun to await delivery" or the even better "Mother of quintuplets eats with her belly serving as the dinner table." On June 15, the media came with Director Li of the Puji Hospital in Changchun to visit the pregnant woman. The hospital was willing to provide a free examination. When the woman was found, she hid in the bathroom and refused to come out. When the family cajoled her to come out, she knelt down on her knees and began to cry aloud. Then she took out what was underneath her dress: a total of twenty items including three cotton blankets, plus cotton-padded coats, wool sweaters, jackets, wool hats and a cotton cushion. The weight is about seven or eight kilograms. 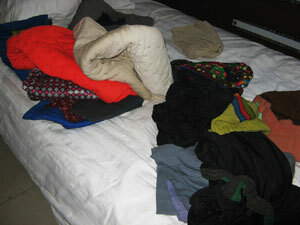 Here is the photograph of the inventory. The woman is 17 years old (note: she told the reporters that was 23 years old) and got married early last year. She got pregnant with twins, but had a miscarriage. Six or seven months ago, she got pregnant again and the doctor said it was either triplets or quadruplets. About three months ago, she miscarried again. Considering that her husband was an only son in his family and he was just involved in an automobile accident, she decided to lie about it by stuffing clothing and cushions. She said that she is actually three months pregnant at this time, but this has not been confirmed by the doctors. What is the husband's role? He was the one who told the media that she had 72 cm waist before her 'pregnancy' but that she was growing by 9 cm per day for the last half month until she reached 175 cm after five months of pregnancy. When asked how he knew that it was quintuplets, he said, "I don't remember whether I accompanied my wife to any hospital. But I remember that I went food shopping with my wife once and an old lady checked her pulse and said that it was quintuplets." The husband said that he fed the information to the media because he was worried that he won't be able to support a set of quintuplets. So he wanted to arouse care and concern from society through the media. "I'm very troubled right now, but I need to understand my wife. She did this for me. If I don't understand her, she has nothing left ..."
This then leads to the question about the culpability of the media. The quintuplet story is the result of the vicious market competition in which the media organizations need to attract eyeballs in order to survive and grow. But that did not mean that they should fabricate sensationalistic stories to satisfy reader curiosity and thereby completely destroying public confidence in the media. As a sidenote, the media criticism also pointed out that the sloppiness in the coverage of this story even reach into something as simple as saying Songyuan city of Heilongjiang province instead of the correct Jilin province.